I’m a Chinese New Year’s orphan; Mama and Papa Tsoi are across the country, so I am left to celebrate on my own. 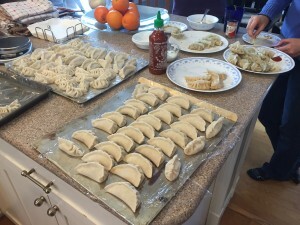 I decided that it would be a perfect opportunity to host a dumpling making party. There are many traditional foods that one has to have, almost all of them symbolizing wealth and prosperity. Dumplings are essential as they are similar in shape to old-fashioned silver ignots. Legend has it that the more dumplings you eat during the New Year celebrations; the more money you can make in the New Year. 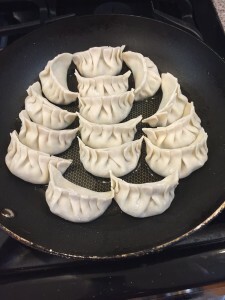 I did a fair amount of research and testing leading up to the party and what I discovered is that dumplings are super versatile. Your basic filling involves a meat, a vegetable, herbs, spices, eggs for binding, cornstarch for absorbing excess moisture, and whatever seasonings you would like. Mama Tsoi makes her wrappers from scratch, but I cheated and used store brought. 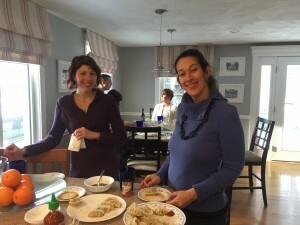 I put 9 friends to work, folding and pleating dumplings, while I focused on cooking. You can steam, boil, panfry or deep fat fry. I prefer the panfry method, as it results in a crispy bottom and tender tops. 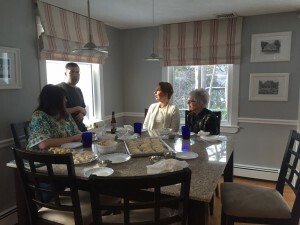 They were fast learners and 300 dumplings were done in a jiffy. 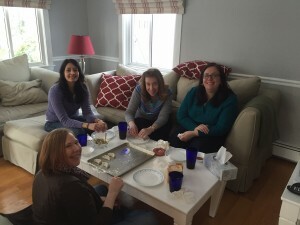 It was a wonderful afternoon of cooking, eating and drinking (lychee martinis). I feel less like an orphan. Commercially available dumpling wrappers (enough to make ~250 dumplings) Twin Marquis was the only brand I could find. I recommend the shanghai style (white) round wrappers. Using a food processor (in batches), finely chop the Napa cabbage, using the pulse. Set in a strainer, lightly salt and let sit for 15-20 minutes. Squeeze out excess water. Chop scallions by using the pulse function. Separately, add salt, pepper, garlic, ginger, soy sauce, sesame oil, rice wine, and corn starch to the ground pork and mix well. Combine the vegetables, beaten eggs, and the ground pork mixture, using hands to thoroughly mix together if necessary. I would cook a small amount and season to taste, accordingly. I took this 1/3 of this filling and added 1 cup of minced shitake mushrooms, and half a bunch of cilantro for a variation. My third dumpling was inspired by tomorrow’s Super Bowl, I made buffalo chicken dumplings. Pulsed it all together in the food processor. This made about 40 dumplings. Gung hay fat choy, my friends!